I have just started making maps and this one's a really simple thing that's bugging the hell out of me. I create a broken bridge, put a repair box next to it and it won't repair. Do I need to link them together or something? Are you using Beginner mode? If not do that and you'll be given the option of placing bridges under the overlay menu and remember to place a bridge repair hut beside it. Anyway, when-ever i use FinalAlert2, i never create a broken bridge... I create a trigger to blow up the bridge(s). Go to the trigger editor, create a new trigger (obviously), go to event's and select "Elapsed Time", set the parameter's as 0. Now, select actions and find "Apply 100 Damage at". When this is all done, click on place on map located in the trigger editor at the top right corner. then, place it on / underneath the bridge(s)... This always works for me any-how. If you know little about triggers, press F1 in FinalAlert, and it'll come up with a small list of tutorials which are easy to follow. Hut must be close to building and it should be Civilian house. Apply 100 damage is a good method but sometimes it's better to make them in FA2 for aesthetics. so how can I repair a broken invul Brige? You can't, as far as i know. Is there any other method to create this other than Aro's trigger approach? I drew the bridge using the overlay menu options, placed the broken bridge overlay manually from the "over & specialy" at the bottom toolbar and then erased the overlay @ 1 field radius. Before I add the broken tiles and erase the parts of the bridge I don't need, the bridge repair huts work when the bridge is destroyed in game, yet after it doesn't. I remember there used to be some trick to making them in FA2, but can't recall after all the years. Ah yes, I remember having that problem too. I think it has something to do with the huts themselves. I think you need to move the huts (their position needs to change at least once, and FA2 has to actually register/confirm that change) or you delete the huts and put them back in. If erase ovelay is used on the bridge tiles then the bridge repair huts don't function. If it is for aesthetics, can use MapSnapshot feature available in TS as a hack and YR with Ares. The map can be played without AI and then the bridge can be damaged in the game and then a map snapshot could be taken. OverlayPack and OverlayDataPack section from the snapshot map can then be copied to the original map. I explicitly remember getting them to work in RA2 1.003 despite that, but can't for the life of me remember how. - From left panel, Special/Overlay -> Bridges -> draw the bridge which shows a black line for from to. - From Overlay & Special dropdown on the right, place the individual broken tiles for the broken ends. Let me know if this works and also mention your working method steps in FA2. Doesn't work, I just tested. - 'building' the bridge via Special&Overlay from start to finish. Then put the broken-off pieces at the right spots, and deleted what's between them. - 'building' the bridge same as above, but having a Trigger to destroy two segments. => chk it out yourself. No, really. I can't do screenshots atm. Test it with two engies at least. Your tests only confirm that making damaged bridges with the above mentioned method doesn't make the bridge repairable straightaway. The question is whether with any other method repairable damaged bridge can be done through FA2. From past 2 years or so, I am using the Map Snapshot method which works, just wanted to know if alternative exists through FA2. In OverlayTypes list, the high bridges use two indices with the same art. Big bridge in air TS/RA2 (index 24, 25), railbridge in TS (index 59, 60) and high wood bridge RA2 (index 237, 238). The art for these contains 18 normal frames. Game divides these 18 frames into two halves and uses those for the overlay index slots differently. For example, for the big bridge: BRIDGE1 is at index 24, BRIDGE2 is at index 25. Both use the same art BRIDGE. The frames of 0 to 8 at index 24 when placed on the map, it is repairable and passable whereas frames of 9 to 17 at index 24 when placed on the map are not usable. On the other hand, frames of 9 to 17 at index 25 are repairable and passable whereas frames of 0 to 8 at index 25 are not passable or repairable. In FA2/FinalSun, when a bridge is drawn from left panel with a line between the ends, it uses the usable frames correctly. But when choosing individual overlay frames from right side overlay and special dropdown, there is a chance of using both the usable and unusable frames to make a bridge. To identify which frames are repairable/passable, it is better to make changes to the language file in FA2/FinalSun. It is easier to make a full bridge from the left panel in FA2/FinalSun, then use erase overlay to clear some of the middle frames and fill up the needed graphics from the right side overlay and special dropdown to make a repairable bridge from within FA2/FinalSun by choosing the correct frames of the overlays. 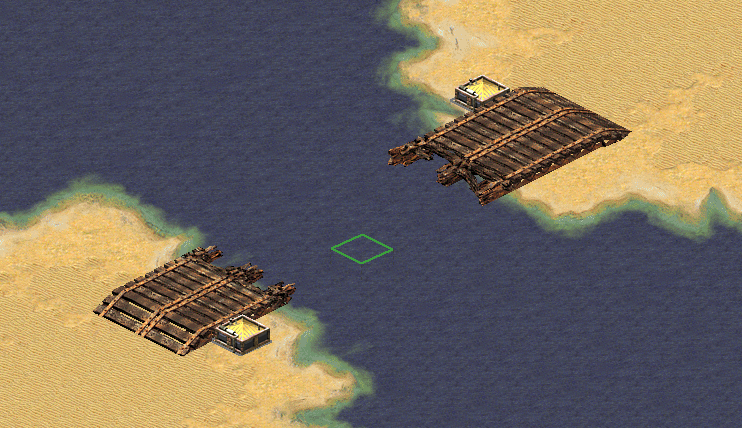 Low bridge either wooden or concrete (RA2/TS), uses three frames to make one bridge piece. When a low bridge is drawn from the left panel of FA2/FinalSun, for every bridge piece, which covers three cells, the tool properly places frames 0, 1 and 2 in alignment with the next bridge piece. From the right side, overlay and special dropdown, in FinalSun only one frame is shown, so only the middle line (frame 1) gives the connectivity. In FA2, three frames are shown but the frames 0 and 2 are invisible, which makes it difficult to place those on the correct cell properly. So it is better to use only the left panel (drawing end to end line) to make proper usable low bridges in FA2/FinalSun.